The death of UCLA lab worker Sheri Sangji is back in the news again, after a coalition including UPTE-CWA urged the LA County District Attorney "to prosecute the case to the fullest extent of the law." An arraignment is scheduled for this Thursday, February 2, and safety advocates fear that a plea bargain will be entered at that time with an inappropriate sentence. The DA filed three felony charges last month against the UC Regents and UCLA chemistry professor Patrick Harran for the fatal 2008 lab fire that led to Sangji’s death. "Like other employers, universities must be held accountable for the safety of their staff as well as students,” said UPTE’s Joan Lichterman on behalf of the union. “Criminal prosecution will be the single most effective deterrent to unsafe laboratory conditions in the future at UCLA and at other universities.” UPTE represents 12,000 researchers and techs at UC, many of whom work in labs. 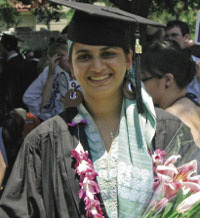 Sheri Sangji at 2008 graduation. The University of California has picked Richmond – just north of Berkeley -- as the site for a second campus of the Lawrence Berkeley National Lab. The new site is expected to open in 2016. A new, independent poll is showing that the Millionaires’ Tax is more popular than any of the other ballot measures vying for approval on the November election. If passed, the measure would raise taxes Californians making over $1 million to fund public education and vital services. On the anniversary of Dr. Martin Luther King’s birth last week, union activists celebrated his contributions to the labor movement.